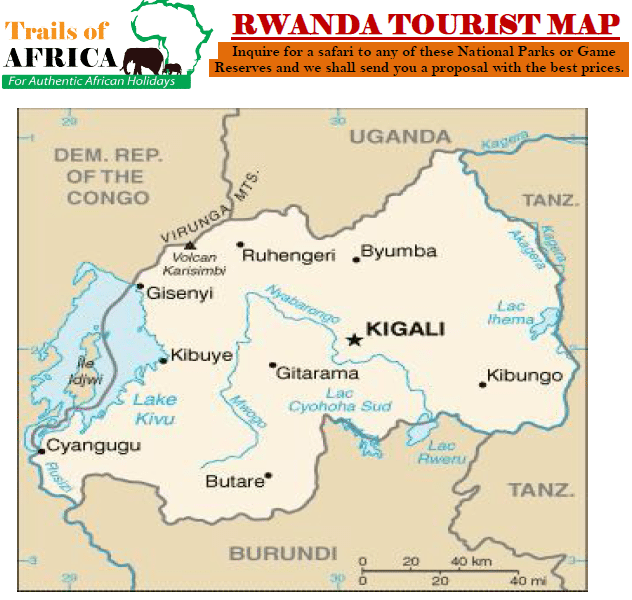 After our breakfast, start your Rwanda gorilla tracking safari by driving for half a kilometer to the head quarters for briefing by park officials and after enter into the jungle to search for the shy mountain endangered gorillas in Rwanda. Requirements like walkable shoes, hut, insect repellent, sun screen, rain gears, packed lunch and bottled water are a must plus other tools that one may need once in the tropical rain forest. Return to your lodge for dinner and overnight. Meal plan: Full-Board. After an early morning breakfast, trek to the Dian Fossey Centre and learn about all the good work she did to save the Rwanda mountain gorillas. It was her effort that helped to conserve these Gorillas in Rwanda and she is therefore respected by all conservationists. If lucky enough, you will enjoy these apes/mountain gorillas in their typical mist. Return to the lodge for your lunch and later drive to Kigali city having an en-route city tour as you head to the airport for your flight back home or to your lodge for dinner and overnight. Meal plan: Half-Board and end of services.